Roshni (Rosh) Kashyap, a vibrant 23 year old individual with Down's syndrome with many interests loves to cook, dance and write songs. 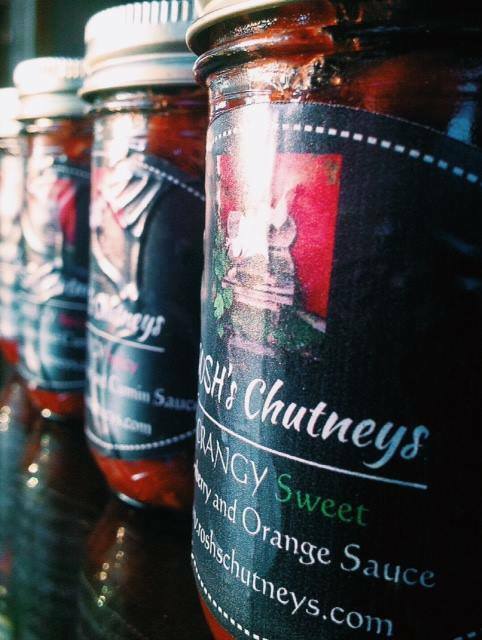 She has now started her own business making chutneys with cranberries. 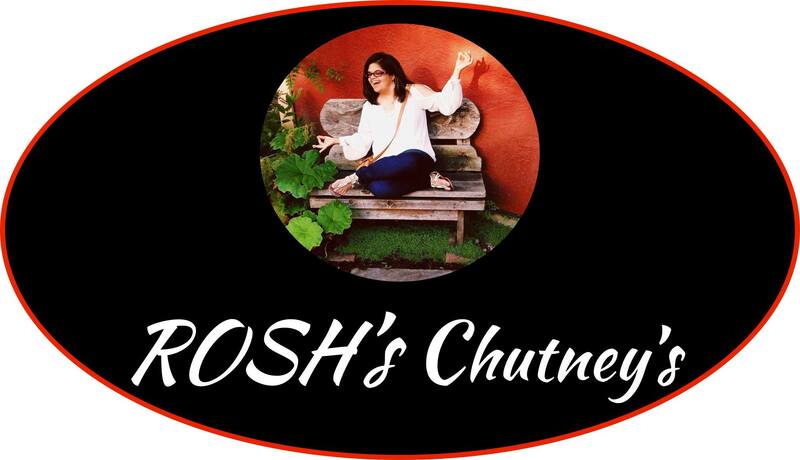 A: So why Rosh's Chutneys? R: I have always been a foodie and wanted to be in the food business , so I did the Food Services program from VCC. Upon graduating I found that isn't easy for a person with special needs to get a job in the real world , even if you are qualified . So my parents and me thought of how I could follow my passion and do what I love and make myself a job in the bargain! My mission is to grow the business to "Give meaningful employment to people with special needs". A: What chutneys do you make? R: I make chutneys with cranberries. We thought let's bring our Indian ethnicity and BC together! We experimented with many many recipes and finally finalized three flavours. So we have the HOT with the red label this one is spiced with ginger and cumin and hot with Cayyane pepper. Then we have the MILD, yellow label, which is spiced with cumin and ginger. And finally we have the SWEET, green label, which is cranberry and orange with cinnamon. All ingredients are local, fresh and healthy. There is Nothing in there that's not good for you, even the sugar I use is Raw cane sugar, not processed sugar. In fact they are fat free , gluten free and vegan as well. 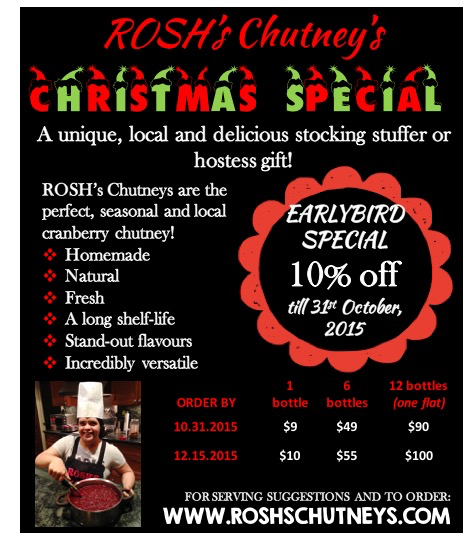 Or on Facebook https://www.facebook.com/Roshs-Chutneys-1501510923423187/ We have a great video of us at the recent Cranberry festival in Fort Langley last weekend. A: How long do these last? R: Well, they are cooked for over 3 hours , so even though they have no preservatives at all, they will stay good in the fridge for up to a year, if kept refrigerated with lid on and dished out with clean, dry spoons. A: Where can we buy them? R: We are at various fairs and farmers markets, we keep updating that information on our website and Facebook page. In fact we are running a special for Christmas , please look at the poster below, if you order before the 31st of October, you can save ! 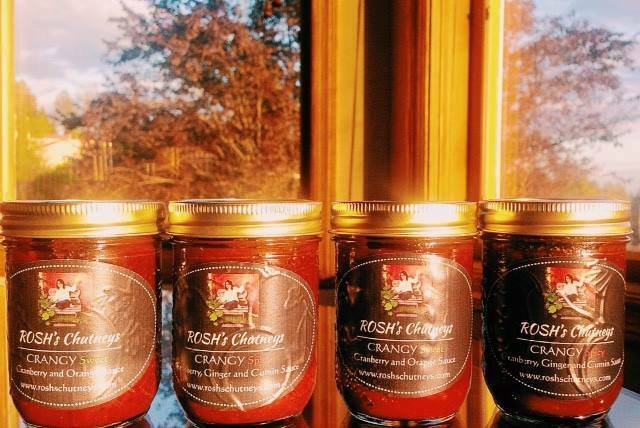 Alice: I have tried all three flavours of these cranberry chutney, they're delicious and it's wonderful to see Roshni being so passionate about cooking and her business. Give it a try! Chutney goes great as a dip with chips, or with sandwiches, or your chicken and turkey.